CORNWALL...New stick frame construction. House not built yet. Photos from another location. Spacious open floor plan 2648` sq. ft. COLONIAL located on 1.3 acre private wooded lot. Local reputable experienced builder will customize home details for buyer if stage of construction allows. Home offers 2.5 baths with ceramic tile flooring, unfinished full walkout basement with slider and large window. 2 car garage attached.Kitchen with granite counter tops, island & kitchen appliances included, breakfast area, formal din/room, liv/room, family room with gas fireplace. 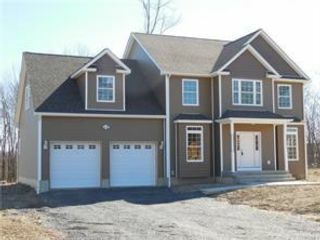 1st floor + upstairs hallway h/w flooring, bedrooms w/ carpets, 2 unit c/air, hydro heat with propane fuel, master bedroom with master bath-double sinks, tub and tiled shower and walk-in closet. Deck, front concrete walkways and more! Convenient location just 5 min. to town center and main arteries of area (I-84, I-87). 10 min. to West Point & Train station. Only 65 miles to NYC. House construction can start by spring of 2019.